If you're looking for Vegas-Style Custom Dice, then you've come to the right spot! These Custom Razor-Edge Dice are designed like the ones found at the world's most exciting casino crap tables. The Transparent, Flush Spots Casino Dice are 3/4" (0.75 inch), and they feature your logo between the two, four, or six dots or around the one dot in circular layout. Our High-Polish, Razor Edge Custom Casino Dice are made of a durable acrylic plastic, and they come in your choice of Red or Green. The Custom Dice are pad printed with the imprint color of your choice – we offer warm gold, warm silver, white, black, or any imprint color you choose. Each pair of Custom Casino Dice comes nicely packed in a mini zip top plastic bag. 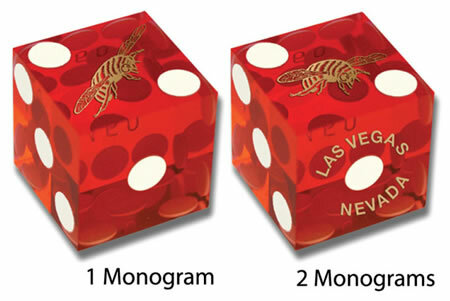 The minimum order for Custom Razor-Edge Casino Promotional Dice is just 100 pair. Standard production time is about two weeks after proof approval.